Are You Prepared for the First Major Snow of the New Year? The new year comes with fresh snow storms threatening our safety on the roads. Although these early days of winter are a great time to relax at home bundled up sipping hot cocoa, don't "chill" until you prepare for the first major snow of the season. Do You Know Who Is Responsible for Clearing Snow and Ice? If a casual snow dusting transforms into snow accumulation, it's time to pull out your snow shovel. Failing to remove snow on your property may create a hazard for family members and visitors, as well as put yourself at legal risk. Many winterize their wardrobe with a new coat or gloves, but most of us probably don't take the time to prepare our cars or motorcycles for winter. We've gathered information on how to winterize your vehicles so you give it the best chance to keep you safe. 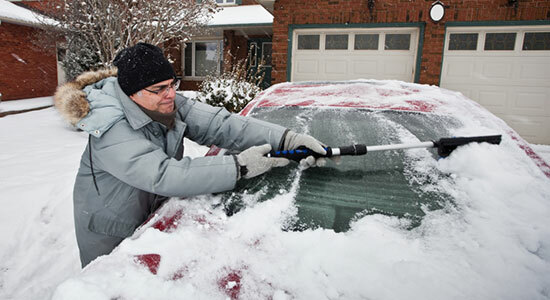 Consult our Winter Driving Checklist – Don't leave home without first checking the list. Are You Prepared to Drive in Winter Weather? Sometimes drivers aren't sure how best to drive in snowy and icy conditions, especially if you are new to an area with harsh winter weather. Of course, it's best to avoid driving at all in these unforgiving weather conditions, but if you can't, make sure you're prepared. Learn the dangers of Isolated Ice Patches – When the weather dips below freezing, these large hazardous ice patches begin to form on the roadways. What to Do After a Winter Car Accident – Find out the steps to take if you're involved in an accident due to black ice, snow, or rain. Were You Hurt in a Winter Weather Accident? If you or someone you love were injured during the winter season—in a car accident, a slip and fall accident, or due to a product you believe is defective, contact the law firm of Edgar Snyder & Associates today. We're here to help, and we're ready to answer your questions about your legal rights. Call 1-866-943-3427, or fill out the contact form on this webpage for a no obligation, free legal consultation. Our phones answer 24/7- even on weekends and during the holidays.